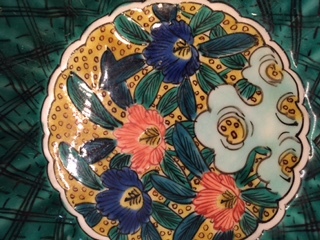 This piece has a bowl in the center with green sides with a crisscross design of black lines, blue, pink and white flowers with leaves on a yellow background with black line circles on the bottom and a red line across the scalloped top edge of the bowl. 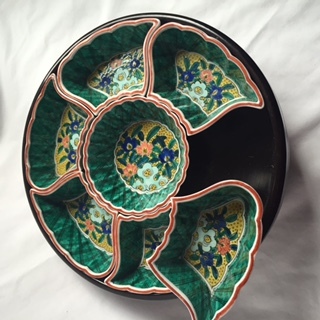 The bowl is surrounded by six matching bowls that have the same patterns. The six surrounding bowls are all identical. I recently had to move my Mother in Laws belongings out of a storage unit. She is still living and is 95 years old. There is no chance she will be able to live independently in her own home again and does not want to risk the theft of her items at the facility where she is now living. I brought all of her items to our small home and am slowly sorting through both useless and precious items. This has been a wonderful adventure for me. Her two sons didn't want to have to deal with the items but I volunteered to go through them myself. I have found a lot of useless items that should have been disposed of years ago. I have found many treasures including, militaria, paintings, prints, old family photos and items that go back several generations. There are beautifully intricate carvings from Bali, Chinese and Japanese pottery. There are items that were collected in Panama, Portugal and Germany among others. Antique dish ware sets dating back to the turn of the century. Here is the history of how this particular piece and others came into our family. My Father and Mother in law traveled to many places in Asia. My Father in Law retired Lt Col in the USMC. He was a veteran of Guadalcanal, The Korean War and WWII. of Saipan in the late 50's. My husband was 5-7 years old there and has many wonderful memories there. My MIL has a passion for art, especially Asian art. They traveled a lot due to her husbands military position and station. After her husband died late in the 1970's she continued to travel with her friend on cruises. She collected many pieces of art, pottery and statues from Bali, Japan, Korea, China and so on. I've spent a lot of time trying to identify the pieces in their estate. The signature on this particular piece appears to me to be an individual's signature. I believe I see the Japanese syllables me, e and possibly ru. I may be way off and may very well have the signature upside down or sideways. My plan is to identify the pieces of value to keep in the family. By value I mean items that are cherished, historical or those that are highly collectible. I am realizing my own love for Asian and Polynesian art and find myself wanting to collect more pieces as I do my research. Many of the items in the estate are identified as Japanese imports, while other appear to have been purchased In Asia. I would like to be able to discern where items originate, are they reproductions. I've decided it's time to educate myself on the marks and designs so I make good decisions when making purchases. I'm a long time fan of the Antiques Road show and attended the show in 2013, when my husband submitted a hand painted Korean flag his father kept after it was liberated from the flag pole in Seoul during the Korean War, they filmed his appraisal, which is available on the online archives. Thank you so much for your help in identifying this piece. Many thanks for your wonderful story and great pics. I hope your research is going well. I can help with a rundown on this item. This is a vintage 1960's Japanese set of serving dishes set in a melamine tray. They come in a variety of patterns and have an array of different markings. Your pattern appears hand painted, at least in part, and the mark appears to be suggesting an artist signature, but it is nonetheless a mass-produced stamp (which I can't decipher). 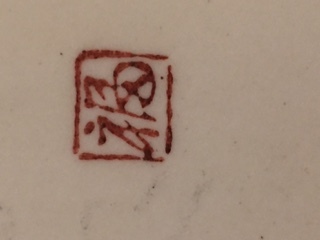 Other patterns in this shape are marked with stamps such as 'Genuine Kutani' and 'Fujita Kutani'. I don't know the maker Fujita, but when I researched there seemed to be quite a few different items by them around, so this might be the attributable factory. I think we can safely say this is export Kutani ware. The value of these at retail was quite high with prices around $80-$120 USD. At auction expect about half that amount.